Ground floor self catering apartment situated in the town of Los Alcazares. This is approximately 30 minutes by taxi from Murcia International Airport (Corvera). The apartment sleeps 4 people, is fully furnished and has a private gated patio area with a table and 4 chairs. There is also air conditioning/heating in the lounge/dining area of the apartment and ceiling fans in both bedrooms. The complex has 3 pools for the use of residents and guests. One of the pools has wheelchair access. The apartment is a 10 minute stroll from the beach (Mar Menor) and promenade. 5 minutes from restaurants and bars. There are 3 supermarkets within 400 metres. The bathroom is fully tiled and is fitted with a WC, bidet, bath with shower and a wash basin. The open plan living and dining room has a table with 4 chairs, sofa, There is Sky TV, DVD/CD player and MP3/iPod speakers. 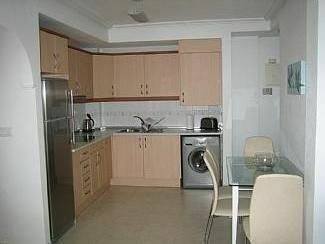 The kitchen has a fridge/freezer, microwave, toaster, kettle. hob, washing machine, cutlery and crockery etc. There are about 10 golf courses within 20 mins drive including the famous La Manga and Jack Nicklaus golf trail courses, Roda golf is 800m walk away. Other sports include windsurfing, sailing, cycling, diving etc. Notes on accommodation: This is a no smoking apartment. There is air conditioning that is also a heater for colder months. Outside: Private gated patio area with a table and 4 chairs. The complex has 2 pools, soon to be 3 for the use of residents and guests. One of the pools has wheelchair access. Utility Room: There is an ironing board and iron. Cleaning / Towels / Linen / Maid service: Towels and linen are provided (not beach towels). The apartment is cleaned prior to your stay. It can be arranged for the apartment cleaning during your stay - pay on arrival. Thanks for your lovely review and I’m glad you had a great stay. 10 minute stroll from the beach (Mar Menor) and promenade. 5 minutes from restaurants and bars. There are 2 supermarkets within 400 metres. Booking Notes: Please contact owner for details. Changeover Day: Please contact owner for details. Notes on prices: Prices shown are for the property per week in UK sterling. There is a 25% non refundable deposit to secure the booking. The balance is due 6 weeks prior to arrival. There is a £150 refundable bond to cover damages, breakages, loss of keys payable either 3 days prior to arrival by paypal or on collection of keys.